In one embodiment, the present invention provides a thermoplastic A nB block copolymer, wherein the A blocks include poly(vinyl pyrrolidone) units and the B block is a long-chain organic connecting unit that includes urethane groups, urea groups, imide groups, amide groups, ether groups, or combinations thereof, wherein n is at least two. As used herein, a “medical device” may be defined as an article that has surfaces that contact blood or other bodily tissues in the course of their operation. This can include, for example, extracorporeal devices for use in surgery such as blood oxygenators, blood pumps, blood sensors, tubing used to carry blood, and the like, which contact blood, which is then returned to the patient. This can also include implantable devices such as vascular grafts, stents, electrical stimulation leads, heart valves, orthopedic devices, catheters, guide wires, shunts, sensors, replacement devices for nucleus pulposus, cochlear or middle ear implants, intraocular lenses, and the like. Typically, the A nB block copolymers are prepared from precursor polymers (i.e., prepolymers), although other methods can be used to build polymers with the same block architecture. In a particularly preferred embodiment, the B block is formed from an isocyanate functional prepolymer (e.g., a diisocyanate polyurethane (OCN—PU—NCO)) and the A block is formed from a substantially monofunctional hydroxyl terminated poly(vinyl pyrrolidone) prepolymer (PVP—OH). In this AnB formulation, the B block is defined to include the functionality formed upon reaction of the A and B prepolymers (e.g., PVP—OH and OCN—PU—NCO prepolymers). If desired, the A blocks of the A nB block copolymers of the present invention could include copolymers of N-vinyl pyrrolidone (i.e., 1-vinyl-2-pyrrolidone) and monomers nonreactive with isocyanate groups or other reactive functional groups on the B-block prepolymer (Y in Scheme I above). Such monomers are selected from the group consisting of (meth)acrylic esters (i.e., acrylic esters and methacrylic esters, also referred to as (meth)acrylates), (meth)acrylamides. (i.e., acrylamides and methacrylamides), butadiene, ethylene, alpha-olefins, halogenated olefins (e.g., tetrafluoroethylene), acrylonitrile, isoprene, styrene, vinyl chloride, vinyl fluoride, vinyl esters, vinylidene chloride, N-vinyl carbazole, and combinations thereof. Thus, as used herein a “PVP” prepolymer or “PVP” block is defined as one that includes a polymer of N-vinyl pyrrolidone or copolymers thereof with one or more other monomers. Preferably, a PVP prepolymer or PVP block includes only poly(vinyl pyrrolidone). Preferably, the functionalized PVP prepolymer is hydroxyl terminated. Although substantially monofunctional hydroxyl terminated PVP is preferred, other functionalized PVPs could be used to form the A blocks of the A nB block copolymers of the present invention (e.g., could be any of the X groups in Scheme I above). Preferably, PVP prepolymers (which can be homopolymers or copolymers) could be functionalized with primary or secondary amine groups, carboxylic acid groups, as well as hydroxyls (e.g., phenols), and combinations thereof. More preferably, PVP prepolymers are functionalized with hydroxyl. It should be understood that the PVP—X prepolymers can include other functionality in the X moiety, particularly ether functionality (e.g., —X can be —C(CH3)2—O—CH2C(O)OH or —C(CH3)2—O—CH2CH2OH). The molecular weight data obtained by GPC was as follows: number average molecular weight (MN)=5570 g/mol, weight average molecular weight (MW)=9420 g/mol, polydispersity (PDI)=1.69. The hydroxyl functionality was confirmed by reacting the PVP—OH with an isocyanate-terminated prepolymer, synthesized as in Example 2, made of diisocyanatodiphenyl methane (MDI) and poly(tetra-methylene oxide) (PTMO). The isocyanate peak at 2270 cm −1 that was present in the prepolymer IR spectrum disappeared upon the addition of the PVP—OH. New peaks corresponding with urethane linkages at 3266 cm−1 and 1727 cm−1 were present in the IR spectrum of the product. This data supports that the poly(vinyl pyrrolidone) was hydroxyl-terminated. SYNTHESIS: Inside a nitrogen atmosphere glove box, 0.4 g PVP—OH was dissolved in 1.62 g anhydrous DMAC in a dry 20-mL screw-top reaction tube. Next, 2.16 g of a 20% solution of the isocyanate-terminated B-block prepolymer in dioxane was added to the reaction vessel. The reaction mixture was shaken and placed in a 60° C. oven inside the nitrogen glove box for eighteen hours. The reaction was monitored by IR spectroscopy. The isocyanate peak at 2270 cm −1 that was present in the prepolymer spectrum disappeared upon the addition of the PVP—OH. New peaks corresponding with urethane linkages at 3266 cm−1 and 1727 cm−1 were present in the spectrum of the product. The solvents were removed by roto-evaporation. 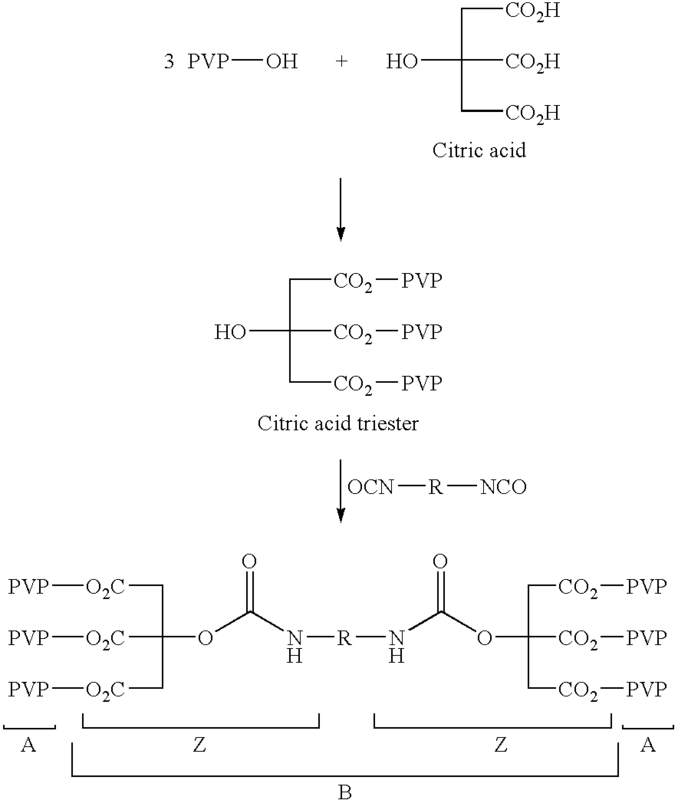 The total yield of PVP—PU—PVP triblock copolymer was 0.52 g, corresponding to a 65% yield. The following summarizes the spectral properties observed by IR: 3266, 2945, 2858, 1727, 1685, 1538, 1424, 1371, 1287, 1225, 1113 wavenumber (cm −1). GPC data was reported as follows: MN=91,800 g/mol, MW=119,000 g/mol, PDI=1.3. A second peak was observed that seems to correspond to excess PVP—OH; MN=5570, MW=7860. The following spectral properties were observed by 13C NMR (CDCl3): δ175, 78.5, 76.5, 75.8, 72.4, 70.6, 68.7, 28.1, 26.4, 24.7, 18.3. The molecular weight data obtained by GPC was as follows: MN=19,200 g/mol, MW=36,400 g/mol, PDI=1.90. The hydroxyl functionality was confirmed by reacting the PVP—OH with an isocyanate-terminated prepolymer made of MDI and PTMO, as in example 2. The isocyanate peak at 2270 cm −1 that was present in the prepolymer IR spectrum disappeared upon the addition of the PVP—OH. New peaks corresponding with urethane linkages at 3266 cm−1 and 1727 cm−1 were present in the IR spectrum of the product. This data supports that the poly(vinyl pyrrolidone) was hydroxyl-terminated. SYNTHESIS: Inside a nitrogen atmosphere glove box, 5.08 g PVP—OH was dissolved in 20.1 g anhydrous DMAC in a dry 30 milliliter (4-ounce) glass jar. Next, 25.44 g of 20% solution of the B-block prepolymer in dioxane solution was added to the reaction vessel. The reaction mixture was shaken and placed in a 60° C. oven inside the nitrogen glove box for eighteen hours. The reaction was monitored by IR spectroscopy. The isocyanate peak at 2270 cm −1 that was present in the prepolymer spectrum disappeared upon the addition of the PVP—OH. New peaks corresponding with urethane linkages at 3266 cm−1 and 1727 cm−1 were present in the spectrum of the product. SYNTHESIS: Inside a Nitrogen atmosphere glove box, 198.87 g PVP—OH was dissolved in 794.79 g anhydrous DMAC in a dry 3-liter 3-neck round-bottomed flask. The flask was placed in a 60° C. oven inside the dry box until the PVP—OH dissolved. The entire prepolymer batch synthesized in Example 10 was transferred to the 3-neck round-bottomed flask containing the PVP—OH in DMAC. The reaction mixture was magnetically stirred and heated with a heating mantle and temperature controller set at 65° C. for eighteen hours. The reaction was monitored by IR spectroscopy. The isocyanate peak at 2270 cm −1 that was present in the prepolymer spectrum disappeared upon the addition of the PVP—OH. New peaks corresponding with urethane linkages at 3266 cm−1 and 1727 cm−1 were present in the spectrum of the product. The following spectral properties were observed by  13C NMR (CDCl3): δ175.3, 153.9, 136.1, 129.4, 118.9, 70.6, 70.19, 64.9, 44.9, 43.6, 42.0, 40.5, 31.5, 26.5, 26.2, 25.8, 18.3. The following spectral properties were observed by proton NMR (CDCl3): δ 7.0, 4.1, 3.3, 3.1, 2.6, 2.2, 2.0, 1.64, 1.5, 1.3. The following spectral properties were observed by  13C NMR (CDCl3): δ175.3, 153.9, 136.1, 129.4, 118.9, 70.6, 70.19, 64.9, 44.9, 43.6, 42.0, 40.5, 31.5, 26.5, 26.2, 25.8, 18.3. The following spectral properties were observed by proton NMR (CDCl3): δ 7.0, 4.1, 3.3-3.8 (broad), 3.1 (broad), 2.2, 2.0 (broad), 1.72, 1.64, 1.5, 1.3. The NMR spectra correspond well with NMR spectra of block copolymers made with the two-step synthesis route. 71. A medical device comprising a surface comprising a thermoplastic AnB block copolymer, wherein the A block comprises poly(vinyl pyrrolidone) units and the B block is a long-chain organic polymeric connecting unit comprising urethane groups, urea groups, imide groups, amide groups, ester groups, ether groups, or combinations thereof, wherein n is at least two, and further wherein the long-chain organic polymeric connecting unit comprises 20 carbon atoms or more. 72. The medical device of claim 71 wherein the block copolymer is biocompatible. 73. The medical device of claim 72 wherein the biocompatible block polymer substantially maintains its physical properties and function during the time it remains implanted or in contact with body fluids or tissues. 74. A medical device comprising a surface comprising a thermoplastic AnB block copolymer, wherein the A block comprises poly(vinyl pyrrolidone) units and the B block is a long-chain organic polymeric connecting unit comprising urethane groups, urea groups, imide groups, amide groups, ester groups, ether groups, or combinations thereof, wherein n is at least two, and further wherein the long-chain organic polymeric connecting unit comprises 100 atoms or more. 75. The medical device of claim 74 wherein the long-chain organic polymeric connecting unit comprises 500 atoms or more. 76. The medical device of claim 75 wherein the long-chain organic polymeric connecting unit comprises 1000 atoms or more. 78. The method of claim 77 wherein the block copolymer is biocompatible. 79. The method of claim 78 wherein the biocompatible block copolymer substantially maintains its physical properties and function during the time it remains implanted or in contact with body fluids or tissues. 81. The method of claim 80 wherein the long-chain organic polymeric connecting unit comprises 500 atoms or more. 82. The method of claim 81 wherein the long-chain organic polymeric connecting unit comprises 1000 atoms or more. 83. A thermoplastic AnB block copolymer, wherein the A blocks comprise poly(vinyl pyrrolidone) units and the B block is a long-chain organic polymeric connecting unit comprising urethane groups, urea groups, imide groups, amide groups, ether groups, or combinations thereof, wherein n is at least two, and further wherein the long-chain organic polymeric connecting unit comprises 20 carbon atoms or more. 84. The block copolymer of claim 83 wherein the block copolymer is biocompatible. 85. The block copolymer of claim 84 wherein the biocompatible block copolymer substantially maintains its physical properties and function during the time it remains implanted or in contact with body fluids or tissues. 86. A thermoplastic AnB block copolymer, wherein the A blocks comprise poly(vinyl pyrrolidone) units and the B block is a long-chain organic polymeric connecting unit comprising urethane groups, urea groups, imide groups, amide groups, ether groups, or combinations thereof, wherein n is at least two, and further wherein the long-chain organic polymeric connecting unit comprises 100 atoms or more. 87. The block copolymer of claim 86 wherein the long-chain organic polymeric connecting unit comprises 500 atoms or more. 88. The block copolymer of claim 87 wherein the long-chain organic polymeric connecting unit comprises 1000 atoms or more. 89. A method of preparing a thermoplastic AnB block copolymer, the method comprising reacting a substantially monofunctional poly(vinyl pyrrolidone) with a functionalized B-block precursor comprising functional groups reactive with the functional groups of the poly(vinyl pyrrolidone) to form the thermoplastic AnB block copolymer, wherein the A blocks comprise poly(vinyl pyrrolidone) units and the B block is a long-chain organic polymeric connecting unit comprising urethane groups, urea groups, imide groups, amide groups, ether groups, or combinations thereof, wherein n is at least two, and further wherein the long-chain organic polymeric connecting unit comprises 20 carbon atoms or more. 90. A method of preparing a thermoplastic AnB block copolymer, the method comprising reacting a substantially monofunctional poly(vinyl pyrrolidone) with a functionalized B-block precursor comprising functional groups reactive with the functional groups of the poly(vinyl pyrrolidone) to form the thermoplastic AnB block copolymer, wherein the A blocks comprise poly(vinyl pyrrolidone) units and the B block is a long-chain organic polymeric connecting unit comprising urethane groups, urea groups, imide groups, amide groups, ether groups, or combinations thereof, wherein n is at least two, and further wherein the long-chain organic polymeric connecting unit comprises 100 atoms or more. 91. A method of preparing a thermoplastic AnB block copolymer, the method comprising reacting a substantially monofunctional poly(vinyl pyrrolidone) with functionalized B-block precursor reactants to form the thermoplastic AnB block copolymer, wherein the A blocks comprise poly(vinyl pyrrolidone) units and the B block is a long-chain organic polymeric connecting unit comprising urethane groups, urea groups, imide groups, amide groups, ether groups, or combinations thereof, wherein n is at least two, and further wherein the long-chain organic polymeric connecting unit comprises 20 carbon atoms or more. 92. A method of preparing a thermoplastic AnB block copolymer, the method comprising reacting a substantially monofunctional poly(vinyl pyrrolidone) with functionalized B-block precursor reactants to form the thermoplastic AnB block copolymer, wherein the A blocks comprise poly(vinyl pyrrolidone) units and the B block is a long-chain organic polymeric connecting unit comprising urethane groups, urea groups, imide groups, amide groups, ether groups, or combinations thereof, wherein n is at least two, and further wherein the long-chain organic polymeric connecting unit comprises 100 atoms or more.